Excel has many functions where a user needs to specify a single or multiple criteria to get the result. 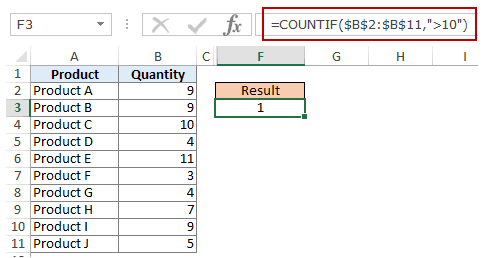 For example, if you want to count cells based on multiple criteria, you can use the COUNTIF or COUNTIFS functions in Excel. This tutorial covers various ways of using a single or multiple criteria in COUNTIF and COUNTIFS function in Excel. 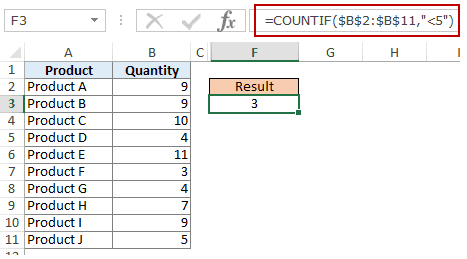 While I will primarily be focussing on COUNTIF and COUNTIFS functions in this tutorial, all these examples can also be used in other Excel functions that take multiple criteria as inputs (such as SUMIF, SUMIFS, AVERAGEIF, and AVERAGEIFS). 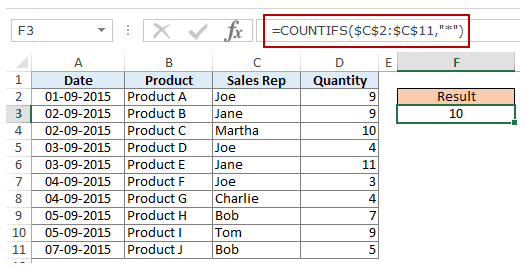 Let’s first get a grip on using COUNTIF and COUNTIFS functions in Excel. 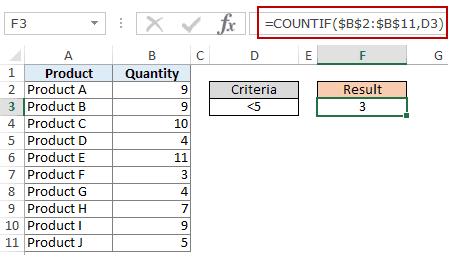 Excel COUNTIF function is best suited for situations when you want to count cells based on a single criterion. 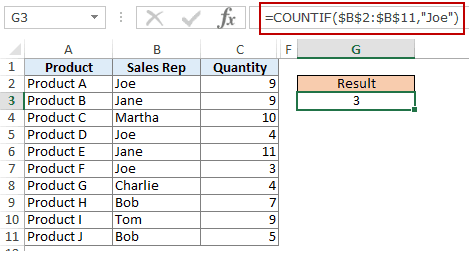 If you want to count based on multiple criteria, use COUNTIFS function. 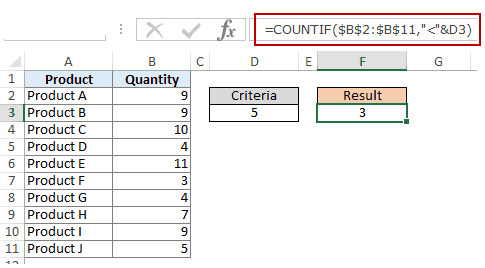 Excel COUNTIFS function is best suited for situations when you want to count cells based on multiple criteria. 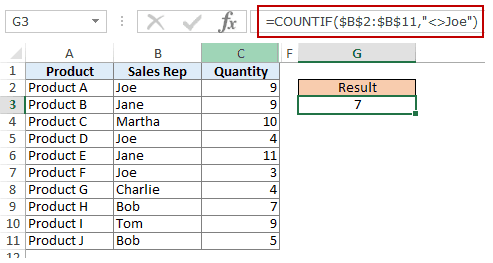 Now let’s have a look at some examples of using multiple criteria in COUNTIF functions in Excel. To get the count of cells where the criteria argument is equal to a specified value, you can either directly enter the criteria or use the cell reference that contains the criteria. To get the count of cells with a value greater than a specified value, we use the greater than operator (“>”). 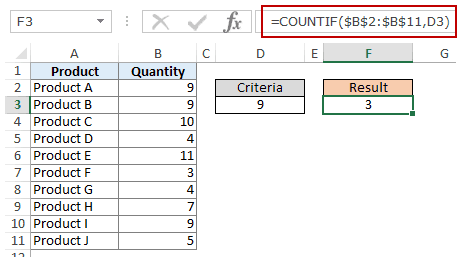 We could either use it directly in the formula or use a cell reference that has the criteria. There could also be a case when you want the criteria to be in a cell, but don’t want it with the operator. For example, you may want the cell D3 to have the number 10 and not >10. NOTE: When you combine an operator and a cell reference, the operator is always in double quotes. The operator and cell reference are joined by an ampersand (&). To get the count of cells with a value less than a specified value, we use the less than operator (“<“). 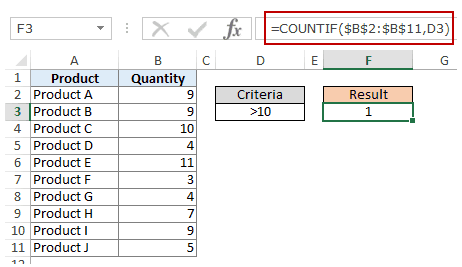 We could either use it directly in the formula or use a cell reference that has the criteria. Also, there could be a case when you want the criteria to be in a cell, but don’t want it with the operator. For example, you may want the cell D3 to have the number 5 and not <5. 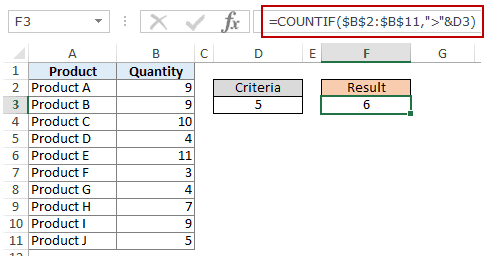 To get a count of values between two values, we need to use multiple criteria in the COUNTIF function. You can also use a combination of cells references and operators (where the operator is entered directly in the formula). When you combine an operator and a cell reference, the operator is always in double quotes. The operator and cell reference are joined by an ampersand (&). In the above formula, we first find the number of cells that have a value greater than 5 and we subtract the count of cells with a value greater than 10. This would give us the result as 5 (which is the number of cells that have values more than 5 and less than equal to 10). You can have these criteria in cells and use the cells references, or you can use a combination of operators and cells references. Since this is a text string, I need to put the text criteria in double quotes. NOTE: You can get wrong results if there are leading/trailing spaces in the criteria or criteria range. Make sure you clean the data before using these formulas. Similar to what we saw in the above example, you can also count cells that do not contain a specified text. To do this, we need to use the not equal to operator (<>). There could also be a case when you want the criteria to be in a cell but don’t want it with the operator. For example, you may want the cell D3 to have the name Joe and not <>Joe. When you combine an operator and a cell reference, the operator is always in double quotes. The operator and cell reference are joined by an ampersand (&). Excel store date and time as numbers. So we can use it the same way we use numbers. To get the count of cells that contain the specified date, we would use the equal to operator (=) along with the date. This formula would return the same date despite regional differences. For example, 01-09-2015 would be September 1, 2015 according to the US date syntax and January 09, 2015 according to the UK date syntax. However, this formula would always return September 1, 2105. To count cells that contain date before or after a specified date, we can use the less than/greater than operators. Similarly, you can also count the number of cells before a specified date. If you want to include a date in the counting, use and ‘equal to’ operator along with ‘greater than/less than’ operator. You can also use a cell reference that contains a date. In this case, you need to combine the operator (within double quotes) with the date using an ampersand (&). We can do this using two methods – One single COUNTIFS function or two COUNTIF functions. In the above formula, we first find the number of cells that have a date after September 2 and we subtract the count of cells with dates after September 7. This would give us the result as 7 (which is the number of cells that have dates after September 2 and on or before September 7). Also, you can have the criteria dates in cells and use the cells references (along with operators in double quotes joined using ampersand). Note: The formula above ignores cells that contain numbers, blank cells, and logical values, but would count the cells contain an apostrophe (and hence appear blank) or cells that contain empty string (=””) which may have been returned as a part of a formula. Here is a detailed tutorial on handling cases where there is an empty string or apostrophe. Here is a detailed tutorial on handling cases where there are empty strings or apostrophes. Below is a video that explains different scenarios of counting cells with text in it. If you are thinking of using COUNTA function, think again. Try it and it might fail you. COUNTA will also count a cell that contains an empty string (often returned by formulas as =”” or when people enter only an apostrophe in a cell). 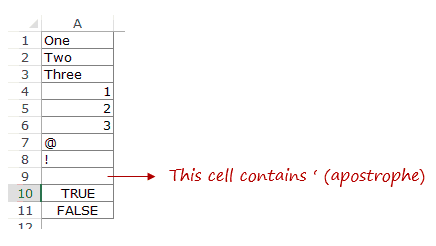 Cells that contain empty strings look blank but are not, and thus counted by the COUNTA function. COUNTA will also count a cell that contains an empty string (often returned by formulas as =”” or when people enter only an apostrophe in a cell). Cells that contain empty strings look blank but are not, and thus counted by the COUNTA function. So if you use the formula =COUNTA(A1:A11), it returns 11, while it should return 10. COUNTIF($N$8:$N$18,”? *”) – This part of the formula returns 5. This includes any cell that has a text character in it. A ? represents one character and * represents any number of characters. Hence, the combination ? * in the criteria forces excel to count cells that have at least one text character in it. COUNT($A$1:$A$11) – This counts all the cells that contain numbers. In the above example, it returns 3. SUMPRODUCT(–ISLOGICAL($A$1:$A$11) – This counts all the cells that contain logical values. In the above example, it returns 2. The criteria J* specifies that the text in a cell should begin with J and can contain any number of characters. If you want to count cells that contain the alphabet anywhere in the text, flank it with an asterisk on both sides. For example, if you want to count cells that contain the alphabet “a” in it, use *a* as the criteria. This article is unusually long compared to my other articles. Hope you have enjoyed it. Let me know your thoughts by leaving a comment. Count the number of words in Excel. Count Cells based on Background Color in Excel. My friend came to me and gave a task in excel to delete blank row from the data so the worksheet would be convenient to further handling. That sheet has contain more than 20000 thousand rows. So defiantly manually would be like headache! I did know about ready-made option available to find blank rows but it takes too much processing time and also uses processor. So I added one column to left most of the data and applied IF and COUNTBLANK formulas …..an i knew the column count is 172. If I got the 172 in the cell it means the row is blank. And the i attached that cell function to the last row count and Walla….. I filtered 172 and removed the blank rows and again unfiltered the data….and at the end I have required format of worksheet. I just took 20 seconds to do that. Would be better if you explain this a bit more or share an example file. Sumit, thank you for replying. AE and UG is a place holder (Name). If the user selects the name AE it will add 21 days to the date from cell B2. If the user selects UG it will add 14 days to the date from cell B2. The formula you sent works GREAT but how would I add UG and 14 days? Interestingly, COUNTBLANK counts blank cells and blank cells returned by formula, as well as a single apostrophe.